Following the demise of Windows XP, Microsoft Office 365 has been getting a lot of attention from organisations searching for cloud-based office applications. Whilst Microsoft Office 365 security features are robust, they may not provide everything some businesses need. With that in mind, TechTarget.com recently did an interview with expert Dave Shackleford looking at the security pros and cons of Microsoft’s cloud-based productivity suite. “Microsoft Office 365 runs in a typical multi-tenant public cloud environment. Active Directory containers are used for isolation and segregation of customer data, but Microsoft also makes a separate Office 365 environment available to customers at additional cost. “All access to the Office 365 infrastructure is performed via strict role-based access control (RBAC) techniques that use a “lockbox” approach. This is where engineers request access for specific tasks that are independently verified and vetted each time, with access duration and monitoring applied. “All network connections to Office 365 also use SSL/TLS over the Internet by default. Within the Office 365 environment, stored data is encrypted with BitLocker, Microsoft’s encryption feature that leverages the Advanced Encryption Standard algorithm. “Office 365 has customizable encryption policies that can be applied to stored content or used to sign documents. The Windows Rights Management Service allows administrators to specify who can access encrypted content, what type of access a user has and when they can access the content. In addition, Microsoft now offers configurable encryption for email. Office 365 Message Encryption is built on Azure Rights Management, which allows administrators to flexibly control when and how encryption is applied depending on a number of customizable attributes, including content keywords or internal vs. external recipients. “One of the more compelling features within Office 365 is data loss prevention (DLP) policy control. With Exchange Online and Outlook 2012, security administrators can develop DLP rules that alert users when they are trying to send email with content or attachments matching well-known or custom patterns for sensitive information. Content can be allowed with a warning, allowed with an explicit policy override that notifies administrators, or blocked entirely based on sender, receiver, internal and external addresses, domains and more. Data Loss Prevention has been developed for Microsoft OneDrive, a cloud-based storage drive accessed from users’ mobile devices, laptops and desktops. “One downside to the service is the lack of malware and spam email evidence available to customers from Microsoft. As Microsoft blocks attachments and spam emails, it does not provide the blocked content to customers for threat intelligence and malware analysis. For larger organizations seeking to bolster security intelligence by mining spam and phishing data, this may prove to be a big downside to an otherwise valuable security offering. “The Data Loss Prevention service, while admin-friendly, is fairly simplistic, which may prove to be less granular and configurable than some organizations need. On the whole, Office 365 offers a powerful and flexible set of cloud application services that include a broad range of features. As more security features are added, organisations that move to Office 365 will find its security is more than capable of meeting their needs. PM Computer Consultancy provides IT Services, Support and Training to sole traders and small businesses in Ipswich. Bury St Edmunds and surrounding villages. Microsoft is introducing a new feature for Office 365 business customers. Clutter aims to sweep unimportant messages from their in-boxes. It uses machine learning to work out which messages are important to you and which can be filed away in the Clutter folder. The aim is to remove potential distractions from your view. Based on Microsoft’s Office Graph technology, Clutter aims to improve the relevance of information you are presented with, highlighting documents, conversations and contacts that are most relevant to your work. “It gets smarter over time, learning from your prior actions with similar messages, and assessing things like the type of content and even how you are addressed in the message. Clutter has now been rolled out to Office 365 for business users although isn’t switched on by default. If you do switch it on, you’re unlikely to notice any major changes for the first few days as the software learns your email reading habits. Should You Still Be Using Microsft Office? Have you noticed you’re being pushed towards Office 365? In the past, Microsoft Office has always been part and parcel of computing. Everyone used it, which meant you weren’t inclined to move away due to potential compatibility issues. If it was what you used at school you naturally used in in adulthood. But times have changed, so perhaps you ought to be asking yourself whether your time as an Office stalwart has come to an end? Microsoft are also feeling it’s time for a change, hence it’s push towards the rental model of Office 365. This involves paying a set fee per month/year to use the latest version of its desktop suite. If you’re not sure what’s right for you, PCPro has compared all the offerings against Office 365. Here’s their verdict. Home users have less reasons to stick with the desktop version of Office than ever before, especially when it comes down to cost. Why pay £8 per month on a productivity suite when there are some excellent alternatives for much less or nothing? Granted, some may be lacking in some poser and features, but considering the cost savings many of you may well decide you can live with that. If Microsoft want the next generation to grow up with Office on every machine they use they’ll have to review their pricing policy. Some businesses have made the switch away from Office, but there are stronger reasons to stick with it, especially the rental model offered by Office 365. The free online alternatives don’t yet offer the range and quality you get through Office 365. The added benefits of hosted email, shared calenders, web conferences, online access (so you can get your information anywhere), SharePoint and Lync. Value for money is definitely there for business users and it’s variety of packages makes it hard to beat. Author itsupportbloggerPosted on September 10, 2014 Categories Microsoft Office 365Tags home vs office use, Microsoft Office 365, Office 365 value for moneyLeave a comment on Should You Still Be Using Microsft Office? Since its launch, Office 365 has been selling at a rate of more than one subscription per second. Incredible – most of us would give our right arm to get sales figures like that. Marketed as a platform designed to help users get their work done, feedback from happy customers shows the suite is living up to expectations. But what about rural customers? 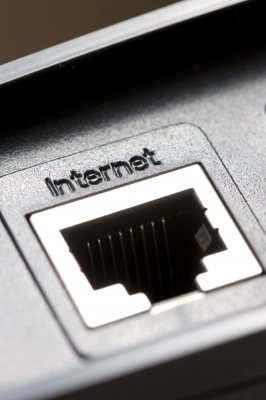 Because Office 365 requires a download to install it, and many rural businesses are constantly battling with broadband speeds of less than 2mbps, some potential customers may well start looking elsewhere for an alternative platform to use. Even if BT’s roll-out in upgrading many rural areas is a success, it will only guarantee 2.5mbps – hardly in line with the urban areas that enjoy speeds of up to 15mbps. This will be a big reason for many rural businesses to look for a different solution. After all, if the broadband speed isn’t there, they still have to run their businesses. Are you a rural business? If so, what alternatives to Office 365 have you found? Is all the hype about Microsoft Office 365 true? Will it really transform your experience compared to the desktop version of Office? Office 365 is a relaunch of Microsoft‘s clumsily named Business Productivity Online Suite (BPOS). Bizarrely, it’s also referred to on Microsoft’s own website as Business Productivity Online Softwareand Services – giving the impression that the branding was never quite spot on. 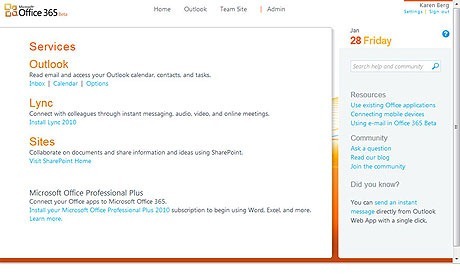 The basic Office 365 package is an upgrade to the 2010 versions of Exchange, SharePoint, Office Communications Online and Live Meeting – the last two of which have become one and are now known as Lync. More interesting though are the additional Office Software Online options that it brings. You can have online web apps at a small extra cost, and for a bit more subscribe to full Microsoft Office. Despite cynics referring to this as a glorified rebranding exercise, the inclusion of the most commonly used office software in the world certainly adds a massive edge. Furthermore, the increase in options in SharePoint 2010 and Outlook Web access 2010 is considerable. 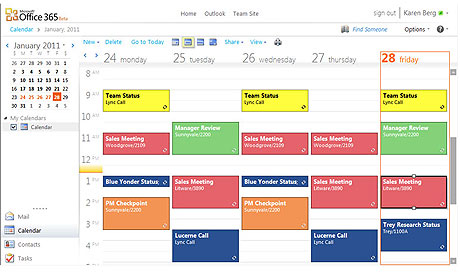 BPOS customers can relax in the knowledge that their subscription will soon be upgraded, while others who bought traditional SharePoint and Exchange spent a week installing it and setting it up on an expensive server will be on the same old system, eyeing their competition jealously as their productivity increases along with their new software. Okay, it might not be that dramatic, but when future upgrades happen – and the cost of new servers and server maintenance don’t rear their ugly heads – it will have a big effect on costs and continuity. Old servers can be a dangerous game if not backed up, as massive data loss can be terminal – especially to small businesses. This approaches another big improvement – the provision to subscribe with fewer than five users, which puts cost-conscious small businesses in a position to pay a fair price and have a system that can grow with them. A subscription to Office, for instance, can save a startup company thousands on initial software expenditure, meaning they can pay as they start to make money rather than at start up. If you’re new to the cloud, then it is worth pointing out that all of this basically means that you move one or two of the big servers in your office into the bin and access everything instead from Microsoft’s servers. Microsoft Exchange syncs perfectly with your local Outlook and can be accessed anywhere online using Outlook Web App (previously Outlook Web Access – yes, the name changes are endless) which is used to manage email, calendars, contacts and tasks. A full Personal Information Manager in the cloud is a massive bonus, and the Outlook Web App means you have most of the functions of your desktop Outlook at your fingertips wherever you are, not just when you’re on your own PC. The range of options and features are vast in comparison to the 2007 OWA and gives users a great deal more flexibility in how they manage their email and time. This is where Microsoft really shines: OWA syncs with your on-premises Outlook. Equally, Office 365 supports the SharePoint Workspace offline tool, meaning you can work on your desktop and then sync with the cloud when you are connected. If you’ve used SharePoint 2010, which is a big improvement on 2007, the online version is virtually the same. The familiar MS Office style means that it is easy for anyone familiar with Microsoft software to learn. It’s perhaps unfair that Microsoft has the inherent advantage of a familiar user interface, but nevertheless it does – and that’s all there is to it. SharePoint is a great document management tool. It can be made as simple or complex as you like with its greatest advantage being its one size fits all approach (and equally perhaps its greatest drawback). Many users like the basic approached offered by a shared drive, rather than the complexities of document management and so simple document storage facilities can be setup for access by groups of users with as much filing and process as you deem suitable. 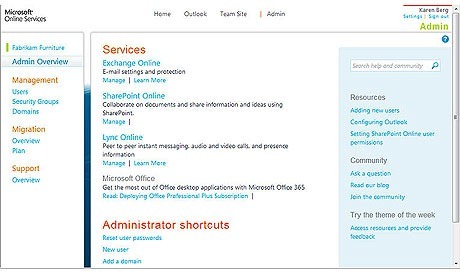 SharePoint 2010 in Office 365 can also be used as a public-facing web presence with easy-add features such as maps and PayPal integration. By clicking the website button in a team site, you’re taken straight to an online web page. This isn’t a full solution and is obviously not going to remove the need for a website; however, while designing your site, it can be very useful as a landing page. For companies that don’t spend much time on the web, or much money on IT, it can provide that simple web presence which will allow people to verify your company as essentially “real”. Before or after meetings, everyone invariably checks a company’s website; if there’s nothing there, then it certainly doesn’t look good. Finally, there’s Lync 2010, combining instant messaging with web conferencing. This can definitely save time and money – we’ve found through BPOS that the OCO (IM) is very well received. It’s a product linking all of a company’s users, and one which definitely saves money and sometimes deals. When sitting in a meeting with your laptop, you essentially have a silent line to those back in your office. You can basically get questions answered by colleagues without clients even knowing that you’ve asked them. (Well, apart from the frantic typing, perhaps.) It’s something that many companies never knew they would benefit from until they have it. Unfortunately, there’s no telephone integration yet, although it’s something that is coming in one form or another. Still, it’s easy to allow external users and to invite people to video and audio conferences which, especially for a small business, is extremely powerful software feature given the price. You can also effectively present online through desktop sharing – which, if it suits your business model, can save time and money. Beyond these functions you have your options on MS Office software. This can be delivered via web apps or via a full blown PC download. The subscription service will take away a large amount of focus on basic software upgrades. The Web Apps have the added features which originally made Google Apps really stand out – such as live, collaborative document editing. Obviously with this tied in with Lync you can create collaborative works with extreme efficiency regardless of locality. You can also use SharePoint Workspace to work with documents when you’re offline, synchronizing with Office 365 when you have a connection. The integration with Office 365 and your desktop is very simple. OWA can sync with Outlook 2010 at the click of a button and you can sync both your work desktop and your home PC very easily. Office 365 is the product Microsoft should have released in the first place. The previous name was never up to scratch and the 2007 software, made slimline for the cloud, felt like a kneejerk reaction to Google Apps. No doubt Microsoft had to react, but Office 365 feels more robust. The financial savings over time will be significant and although its price point is a lot higher than Google Apps, I think the options and familiarity are vastly superior. The desktop software almost moves it away from comparison with Google Apps; perhaps most important of all is the free phone administrator support, which has always been a major advantage (and cost) that even BPOS had over Google Apps. Office 365 is officially launched on Tuesday 28 June. It has taken a while, but Microsoft may well have put itself back in pole position in the Software as a Service battle. • Andrew Gradwell has experience in all levels of IT, as a user, support engineer and a company director. Heading up Cloud Hypermarket, he is on a mission to bring cloud savings to companies that really need it, rather than those it is most profitable to sell to.